President Dave Sbarra led discussions of several important issues with which APCS is actively involved. One topic that is central to the mission of APCS involves collaborative training efforts that may improve integration of internship and doctoral programs. 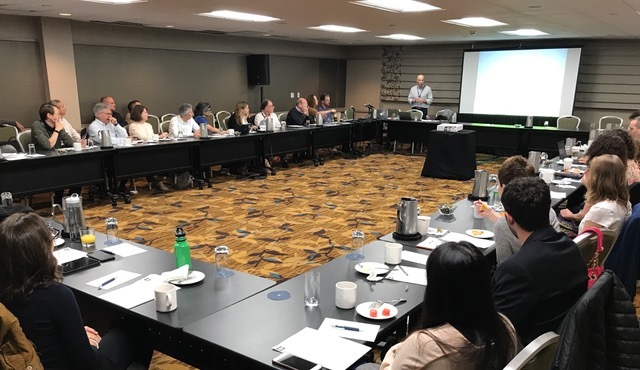 Alan Kraut and Bob Levenson provided an update on PCSAS progress, noting that 35 doctoral programs in psychological clinical science are now accredited by PCSAS. The newest additions are the University of Buffalo, Boston University, and the University of Maryland. An important panel discussion focused on the question: "What does it mean to be a clinical scientist?" Participants included Joanne Davila, Bob Simons, Beth McQuaid, and Howard Berenbaum. This was also the first membership meeting attended by graduate students from APCS doctoral programs. Six students were present, and we hope that more will be able to join us next year. They clearly represent the future of clinical science.